Sorry if this has been asked before, but can anyone explain to me exactly how the air mouse part of the new remote works? Btw, thanks to the COOD-E team for giving is this presale price, really nice gesture! Will there be a qwertZ-version in future? Anyone already received the keyboard? I just bought the Airmouse. Now I only can reach "My Account" under www.cood-e.eu/key (Forum-Member) and not under www.cood-e.eu/shop (official/public). I ordered at 09.02.2016 Status "in Progress"
And I got a DHL delivery e-mail. So order/shipping/arrival approximately four days. I ordered mine around lunchtime on the 12th (a Friday so allow a few extra days for the weekend) it's now the 17th and I've not received any emails at all, even from DHL like steffcood did. I'm hoping it arrives today though. How did you pay? I did use Paypal. If you took another payment method it could take some more days. 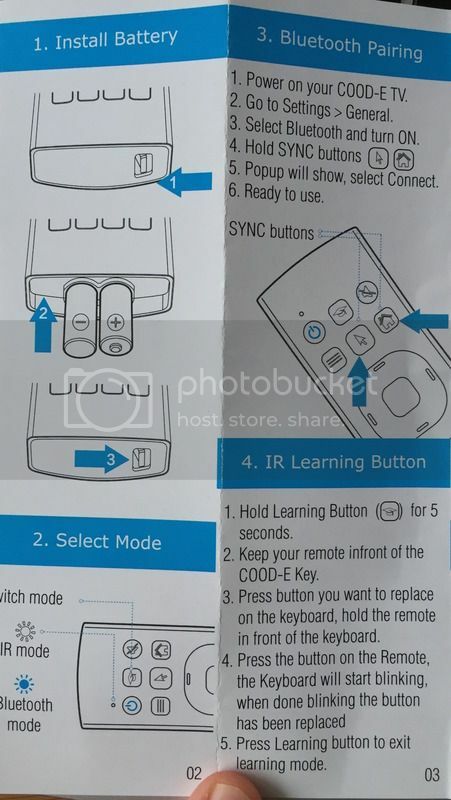 This issue is in Bluetooth Mode or IR mode, did you use the learning method by accident? Where can I find a manual in PDF for COOD-E KEY? I did't get it with the remote. I'm a bit at the moment. I started this topic and setup to notify every reply on it. I never had any notifications on replies and Now I see that the thing is out for a month already and also missed out On the special offer ! It just doesn't work anymore! I'm not even able to get the remote to turn on, or do anything at all, not even removing the battery works. Wanted to send it back for repair, but i need the receipt. Sadly, the place where we bought the remote in pre-sale (divxplayer.nl) doesn't respond to any e-mail/message i send them. 25,- euros down the drain.